81,9 x 75,5 cm - 32 3/16 x 29 11/16 in. 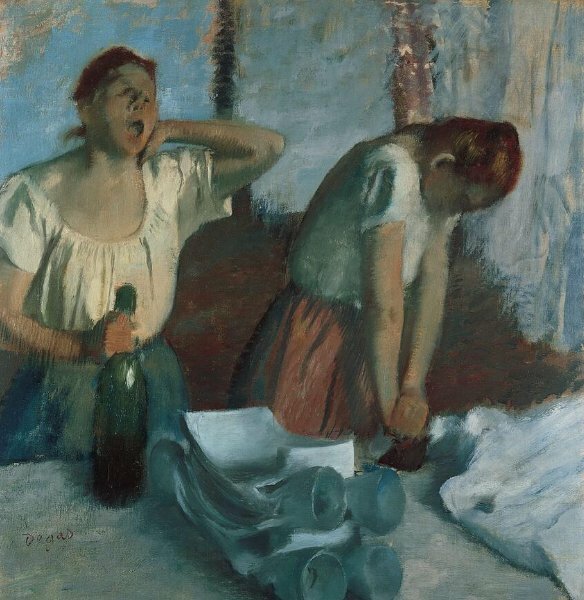 Atelier Degas - Durand-Ruel, Paris, 18 octobre 1902 (Stock n° 7184) – Oscar Schmitz, Dresde et Suisse, 18 novembre 1902 jusqu'en 1933 – Edouard Schmitz, jusqu’en 1935 – Wildenstein Galleries, Londres, New York, circa 1936 – Edith Dunn [Mme Alfred Chester], Londres, Dublin, 1953 – Alfred Beatty jusqu'en 1968 - Arthur Tooth & Sons, 1958 – Lucille Ellis, Norton et Robert Ellis Simon, 1969 - Norton Simon Foundation, Pasadena, 1979. Paris, 11 rue Le Peletier, 1876, n° 41 (?) – Dresde, Internationale Kunstaustellung, 1926, n° 83 – Zurich, Kunsthaus, 1932, n° 23, p. 6 – Zurich, Kunsthaus, 1933, n° 56 – Paris, Wildenstein & Co., 1936, n° 22 – Dublin, National Gallery of Scotland, 1956-1957 [En prêt] – Los Angeles, County Museum, 1965 [en prêt] – Los Angeles, County Museum, 1971-1972, [en prêt] – Princeton, University Art Museum, 1972, n° 40 – San Francisco, California Palace of the Legion of Honor, 1974, n° 34 – Philadelphie, Pennsylvania Museum, 1981 [en prêt] - Degas in the Norton Simon Museum, 2009, n° 7, repr. p. 109. L'art et la couleur. Les maîtres contemporains, 1905, p. 55 (repr.) - Fechter, Kunst & Künstler, 1910, p. 22 – Hourticq, Art & Décoration, 1912, p. 105-106 (repr.) – Hertz, 1920, p. 101, 108 – Scheffler, Kunst & Künstler, 1920-1921, repr. 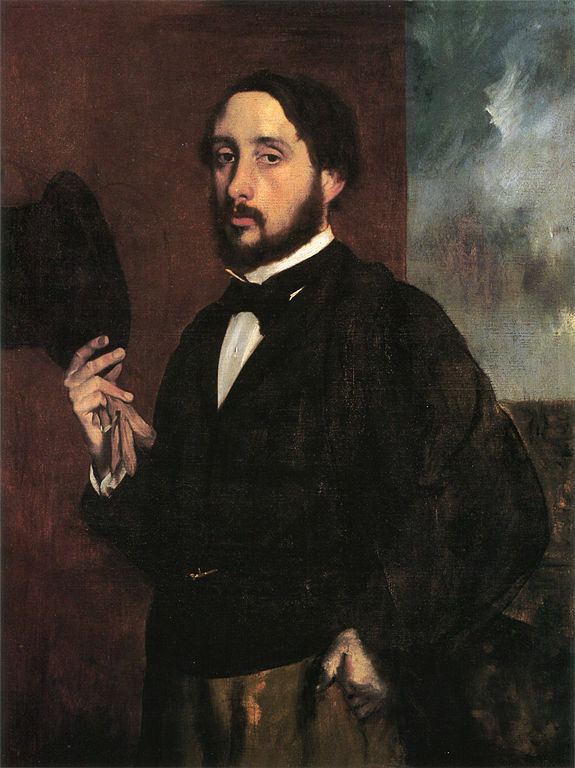 p. 179 – Vollard, Degas, 1924, repr. face p. 114 – Dormoy, L'Amour de l'Art, 1926, p. 342, repr. p. 343 – Schürer, Deutsche Kunst & Dekoration, février 1927, p. 271 – Manson, 1927, p. 52 – Waldmann, 1930, 6/11, p. 320 – The Oskar Schmitz Collection, 1936, n° 22, repr. p. 57 - Mauclair, 1937, p. 110, repr. p. 167 – Rivière, 1938, repr. p. 35 - Dunlop, 1944, p. 76 (repr.) – Lemoisne, 1946-1949, II, n° 687, repr. p. 389 – Steadman, 1972, p. 38 (repr.) – Shirey, 1972, p. 23, 27 (repr.) – Steadman, 1973, p. 11 (repr.) – Clark, 1973, p. 323, fig. 251 – Rewald, 1973, p. 466 (repr.) – Daval, 1973, p. 84 (repr.) – Lassaigne, Minervino, 1974, n° 596, repr. p. 114 - Russell, 1974, II, p. 28, fig. 29 – Steadman, 1976, p. 222, fig. 2 – Hüttinger, 1977, [p. 46] – Barnett, 1978, p. 131-132 – Dunlop, 1979, p. 109-113, pl. 99 – Lipton, 1980, p. 306-308, fig. 37 – Love, 1980, p. 51, pl. 19 – Selected Paintings at the Norton Museum , Pasadena, 1980, p. 112 (repr.) - Silverman, 1982, p. 117-119 – Blake, Harrison, Norman, 1983, pl. II.58 – Lipton, 1986, p. 135-136, 141-143, 147, fig. 88, pl. V – Kelder, 1986, p. 40, fig. 35 – Vollard, 1986, p. 39 (repr.) – Moffett, 1986, p. 146, 158 n° 12, 161, n° 41 [?] – Kendall, 1987, p. 164 (repr.) – Kennedy, 1987, p. 45, 48 n° 16, 51, app. 4 – Love, 1987, p. 139, 141, fig. 14-3 – Ottawa, New York, 1988-1989, fig. 233, repr. p. 426 – Gordon, Forge, 1988, p. 67 (repr.) – Zurich, Tübingen, 1994-1995, repr. p. 68 - Berson, 1996, II, p. 34-35, n° II-41, 49 (repr.) – Druick, 1997, p. 37, fig. 17 – Muchnic, 1998, p. 41, 44, 97, 233, 253, pl. 19 - Rome, Complesso del Vittoriano, 2004-2005, fig. 38, repr. p. 82.